So much work goes into the removal and clean up of the old that it is always so exciting once they start actually installing some of the new pretty stuff! 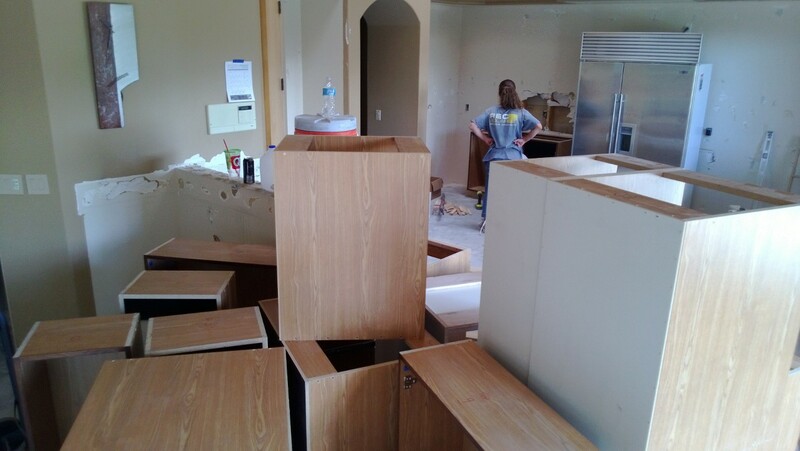 The cabinet boxes had to get installed this day so that we could make granite templates on day 6. The granite fabricator is so busy that he needs 2.5 weeks after they made templates, so this was one of the crucial do or die days. I was happy to learn that they will be ready for the granite guy in the morning- WHEW! DESIGN TIP: We opted to just install the boxes themselves now and then we’ll bring in the drawers and door panels at the end. This way nothing will get dinged up! So much nicer than the concrete! 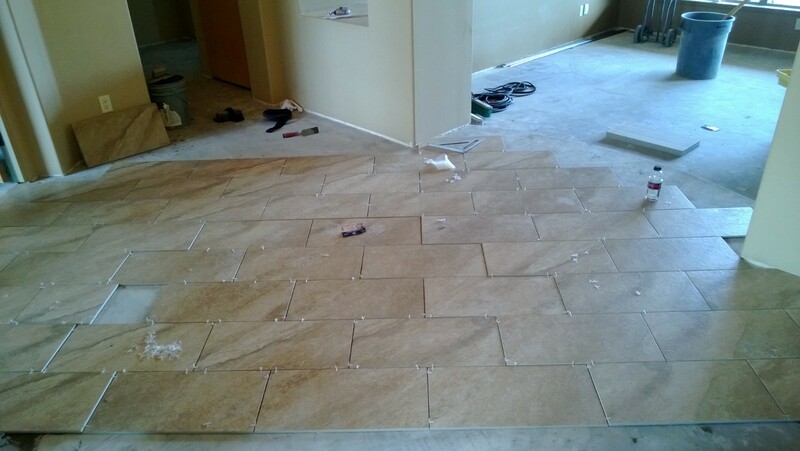 Our client felt like she had been a slave to her travertine floor for long enough, so we selected a neutral color 12″x24″ porcelain tile that had some visual and tactile texture to it as well as a finish that provides some nice reflection. This is what four guys did in about 2 hours. But I know better- it always goes really fast before they start making all of the cuts. Can’t wait to see how far they got after I left! DESIGN TIP: Laying the tile at a 45 degree angle makes a space feel more expansive and directs the energy into the home. I never angle the tile toward the master bedroom, but always to toward the kitchen. I love how this tile has a striation to it that adds another directional pull. The plumbers also worked in the master shower for most of the day. The electrician did a bit of demo and removed a bunch of wiring from a pony wall we didn’t need any more and also took out all of the home intercom boxes. We’ll need a wireless doorbell now, but happy to see those big honkin’ things go!